The RBI has had an interesting statement made on liquidity. We know at Capital Mind that the RBI did some crazy things in 2013 with liquidity – they had taken on massive FCNR deposits for three years, giving banks a 3.5% hedge for the currency. Basically it meant that Indian banks offered risk free deposits to NRIs at 5.5%, taken the hedge at 3.5% and effectively got in money at 9%, which was reasonable at the time. But this is slightly screwed up. RBI wants forward-counterparty banks to give it $20 billion so it can return the FCNR hedge. These banks say not enough dollars in the market for us to buy and give it to you. So they want RBI to somehow supply those dollars in the market. Which means RBI will supply dollars just so that it can get them back from those forward hedges. What’s it warning? That there will be some mad situations in the USDINR market. The prices will go crazy, with RBI participating at extremes. The direction, between now and November (when the FCNR pieces expire), will be a downmove and then a spike when RBI comes, then a downmove again, and up-spike and so on. Fun! 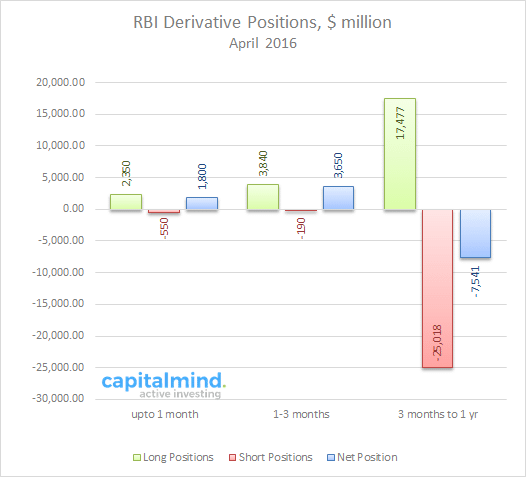 Here’s the RBI’s derivative positions as of April 2016. So about $1.8 billion matured in May. That already saw some volatility in the USDINR. There’s $3.6 billion maturing in June-August. And then, there’s $17 billion maturing after August, and we can assume that the $25 billion will be paid out around November. Oh, this is going to see some mad action, and it’s probably starting soon. In Macronomics (Capital Mind Premium) we will do a more detailed set of posts on how this evolves. (Do subscribe – we have over 400 past posts on Macro, Options and Strategies).